Blowout Sale! 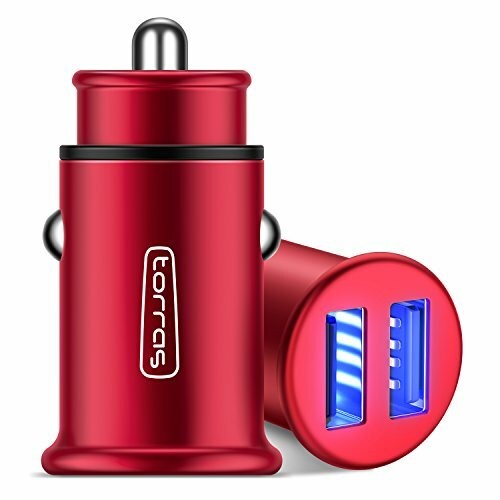 Save 68% on the TORRAS Full Metal Car Charger, 4.8A 24W Flush Fit Dual USB Port Car Power Adapter for iPhone X/8/7/6/Plus, iPad Pro/Mini, Samsung Galaxy, LG and More (1-Pack) - Red by TORRAS at DJ Luu. MPN: TS-CRC-MN-RD-US. Hurry! Limited time offer. Offer valid only while supplies last. Professional Design: Full Aeronautical metal material, matte surface treatment; flush mount fit; Perfect integration with your car cigarette lighter; negative electrode patented design, passed 5,000,000 press tests. Secure Protection: US authorized certification car charger adapter, intelligent circuit design to prevent overheating, over-currents, over-charging, and surge. Focus on Details: USB plugins have LED lights for accurate positioning at night but it's not a distraction to you while driving. It is a 'hat buckle' design, which will never slide out or auto pop out. Quality Warranty: You will enjoy 12 months free after-sales guarantee and a 24-hour quick response to your questions. 100% risk-free. If you have any questions about this product by TORRAS, contact us by completing and submitting the form below. If you are looking for a specif part number, please include it with your message.